If you’ve taken a look at who “experts” around the web predict to take the Western Conference’s 4-5 series, you’ve noticed a running theme; Nearly everyone has picked the Nashville Predators to win their first round series with the Detroit Red Wings. The hype surrounding Music City’s team hasn’t died down since the Trade Deadline. After moves to acquire Andrei Kostitsyn, Hal Gil, and Paul Guastad, the Predators suddenly became Stanley Cup favorites in the minds of many. The buzz only intensified when Alexander Radulov made his return from the KHL just a short time later. Now after securing themselves a 4th place finish in the West there’s no question the team is good, but are they all they’re cracked up to be? Perhaps no one has been more important to the Predators this season than goaltender Pekka Rinne. 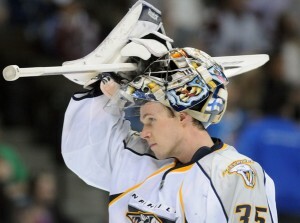 A Vezina Trophy finalist last season, Rinne has proven he’s one of the game’s elite goaltenders. His stats rank well again this season. His 2.39 GAA and .923 Sv% place him in the top 15 of both categories. Those numbers become even more impressive when you consider the number of games he’s played in (73). Yet it’s exactly that which should worry Nashville fans. Rinne has faced more shots than any other NHL goaltender this season. He’s held up remarkably well for having started in 72 games. Eventually though, fatigue has to be a factor. For a team so reliant on their goaltender, it seems hard to believe they could survive a lapse in MVP worthy play from Rinne. A lapse that they’ve increased the chances of encountering thanks to riding him more than any other team rode their starter. At the other end of the ice is a much fresher Jimmy Howard. With a much more reasonable 57 games started, Howard has a better GAA (2.13) and an almost identical Sv% (.920) to Rinne. Don’t forget that Howard’s excellence was recognized with a trip to the All-Star game earlier this season. He’s an incredibly talented goaltender that the Red Wings relied on several times this year. With the 2 goaltenders already playing at such similar levels, Rinne wouldn’t be a significant advantage for the Predators to begin with. Factor in the number of games he’s played and the inevitable drop off of play due to fatigue, and he could actually harm the Predators thanks to their foolish coaching decisions. Aside from Rinne, the most prominently pointed to advantage for the Predators is their special teams; Primarily the powerplay. There’s absolutely no question that this advantage is real, and potentially deadly for Detroit. Nashville’s 21.6% success rate was the best in the league this season. Detroit’s egregious efforts with the man advantage landed them 22nd. On the PK, again it’s advantage Nashville. Ranked 10th in the league, they were successful in killing of their mistakes 83.6% of the time. At 81.8%, Detroit ranked 18th. Yet the thing most people seem to forget is the thing that potentially makes these statistics a non-factor. The Red Wings and Predators are the least penalized teams in the NHL. Powerplay opportunities will be few, and an overwhelming majority of time will be spent playing 5-on-5. 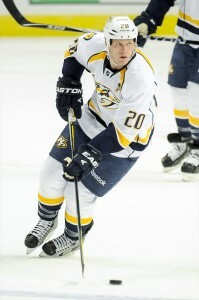 Nashville wont have enough chances to use their powerplay to make it a series changing attribute. Detroit’s ineptitude with an extra attacker will come into play so little that it fails to hinder their scoring in any way. Keep in mind too that Detroit’s penalty killing is improving. They haven’t given up a goal while shorthanded since their March 24th win against the Hurricanes. With few powerplay opportunities and an improving penalty killing team on the other side, Nashville’s reliance on its powerplay could prove to be another nail in the coffin. Much too has been made of Nashville’s supposed deeper team. Yet, at least statistically, the argument holds no weight. Offensively the Red Wings have more players with at least 10 goals, and more players with at least 20 goals. They have 3 players to Nashville’s 0 with more than 60 points, and have more players who have reached at least 20 points. Detroit has both more talented and productive forwards than Nashville (Datsyuk, Zetterberg, Filppula, Franzen) and more players with significant contributions offensively. Their scoring is more spread out, and they have the star players on top of it. Offensively, Detroit is the deeper team. Defensively things are effectively a wash, if not leaning again towards Detroit.. Both teams have talented 2 way forwards and both teams have all-star defensemen. Detroit’s oft injured unit has allowed the 3rd fewest shots against per game in the NHL, and rendered 7 less goals against than the Predators while dealing with the abysmal goaltending of Ty Conklin. Shea Weber & Ryan Suter are perhaps the best pairing in the NHL, but beyond the top 2 Detroit easily has the advantage. The final Nashville proponent I’ve heard mentioned is their size and physicality. 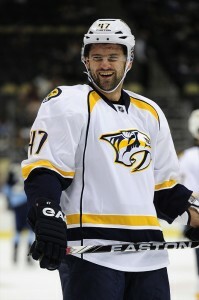 While there’s no question Nashville is a larger team, that doesn’t necessarily equate to being more physical. Even if it did, Detroit has proven they can work around it before. Statistically Detroit delivered nearly 100 more hits this season. They beat the rough-and-tough Boston Bruins. They took the hard-charging New York Rangers into overtime while still struggling with injuries. They dominated the Los Angeles Kings in an 8-2 victory. They beat a grinding St. Louis team 4 out of 6 times this season. Detroit knows how to work around physical, grinding teams. They use their speed and creativity to kill. They can adapt to any kind of game. That’s their experience glaringly shining through. It may in fact be that experience that this series comes down to. 2 talented teams in different ways. Yet Nashville has only won 1 playoff series in its entire existence. It’s players overwhelmingly don’t know success in the postseason. The Red Wings are arguably the most experienced team in the league. They’ve been there and done that. They’ve won Stanley Cups, they’ve won playoff series, and they want more. Was Detroit’s finish to the season unimpressive? It certainly was. Yet in their final games they showed flashes of the team they can be when fully healthy and organized. They proved they can flip a switch and tie games late in the 3rd after being down by 2 goals. They’ve begun to gel again after a month plus of dealing with an injury riddled roster. The playoffs are a different beast. The regular season is done and it’s struggles can now be forgotten. When push comes to shove, the Detroit Red Wings are a better team than the Nashville Predators. Nashville’s reliance on special teams and goaltending will come back to bite them eventually. I fully expect this first round series to show that in its conclusion.